If I put fifty book covers in front of you, would you guess that the book I finished was Clint Emerson's100 Deadly Skills: The SEAL Operative's Guide to Eluding Pursuers, Evading Capture, and Surviving Any Dangerous Situation? No, I haven't gone survivalist on you. Actually, it was part of my job to read it following a request for reconsideration. It might not make my list of favorite books for 2015, but I can recommend it to friends who are writing crime fiction. Think Jack Reacher techniques. Emerson, a retired Navy SEAL, provides techniques that operatives use to prepare for a mission, infiltrate an area, prepare for the operation, watch people, gain access to houses and hotel rooms, set up audio and visual surveillance (and avoid it), take action, avoid capture, and escape. For those not interested in the techniques themselves, there are takeaway summaries on all 100 skills, otherwise known as BLUF (Bottom Line Up Front). Looking for security measures to take in your hotel room, garage, or car? There are hints for those of us interested in a little more self-protection. But, if you're a crime writer looking for ways to dispose of a body, car maneuvers to take to avoid capture, ways to hide information in emails, those techniques are explained as well. Bottom line? There's very little information in 100 Deadly Skills that will matter to the majority of us. Quite a few of the techniques are so involved, or the operative will be so loaded with equipment, that they seem outrageous. They seem a little outrageous even for NCIS' Jethro Gibbs or Lee Child's Jack Reacher. But, some crime writers may find some interesting tips. Oh, and you'll finally learn the best reason for Jack Reacher to buy new clothes when he travels - DNA. 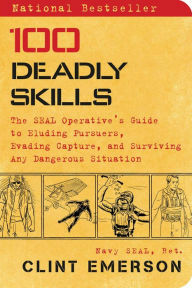 100 Deadly Skills: The SEAL Operative's Guide to Eluding Pursuers, Evading Capture, and Surviving Any Dangerous Situation by Clint Emerson. Touchstone. 2015. ISBN 9781476796055 (paperback), 256p. SO FUNNY!! DNA is the real reason! I haven't read a Jack Reacher for a while, Diane, but I liked him.